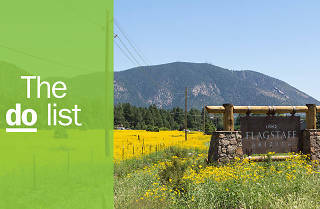 Known for its proximity to the Grand Canyon, Flagstaff is also a college town. Home to Arizona’s third – and smallest – institute of higher learning, Northern Arizona University, its mascot, the Lumberjack, was named for the early logging industry that helped populate the area at the turn of the 20th century. 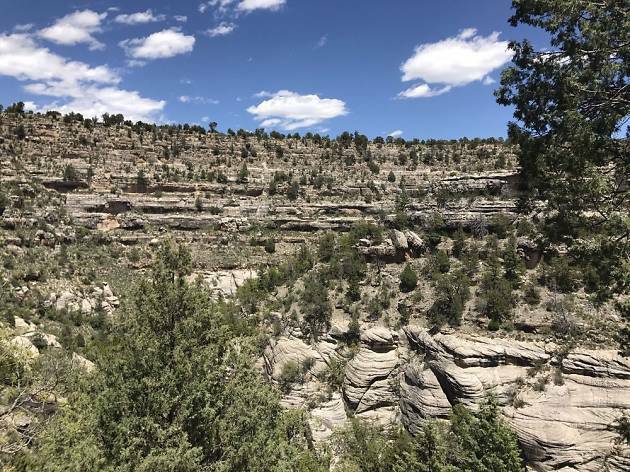 With an elevation that begins at nearly 7,000 feet, it can be a 30-degree or more respite during the day from the heat of Phoenix to the south. 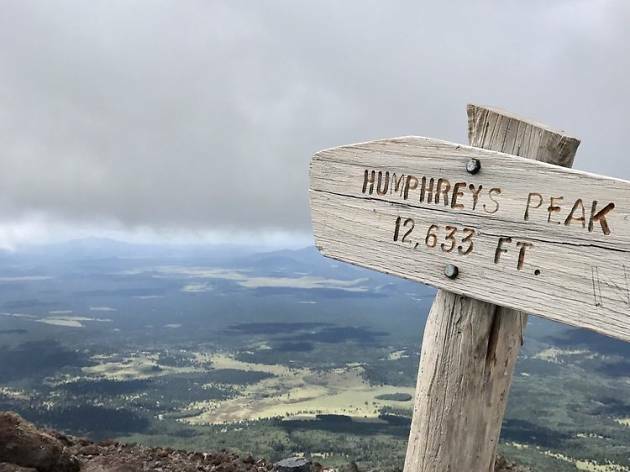 The city is surrounded by the Coconino National Forest, a land of pine trees and aspen groves, and the state’s tallest mountain peak, Humphreys Peak, part of the San Francisco Peaks, sacred to Native Americans who live nearby. 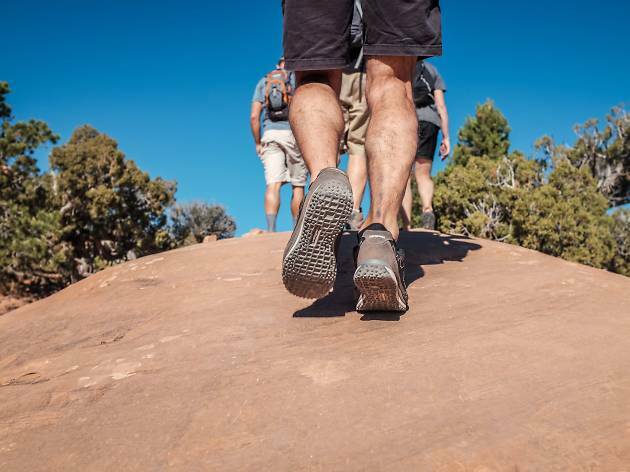 Hiking, biking, skiing, and visiting national monuments are among the top on the list of best things to do—read on for more of the city’s top hits. What is it? 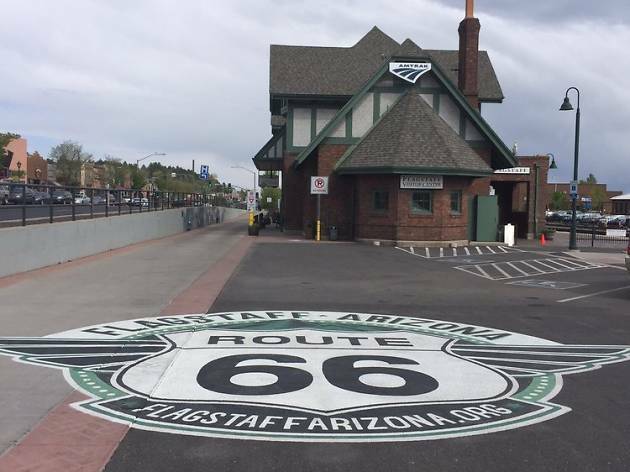 Download the map or pick one up at the Visitor Center at the historic train station (still in operation) on Route 66 and begin the self-guided walking tour from there. Why go? It’s the best way to get to know the city and how it got its start, beginning with a wagon road to California that later became Route 66 – an iconic piece of Americana. The tour, which makes a loop around the railroad in downtown Flagstaff, has just eight stops and takes an hour to complete. What is it? 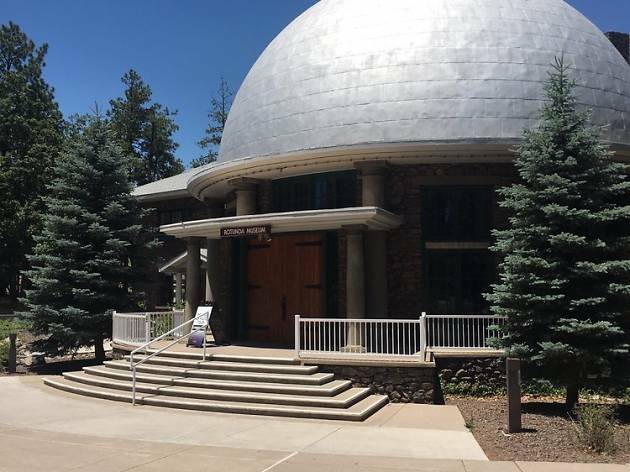 One of the oldest observatories in the country, Lowell Observatory was founded in 1894 by Percival Lowell. Why go? This research institution offers tours, lectures, and day and night telescope viewing. Special events sometimes involve beer. Its claim to fame is the discovery of Pluto as a planet in 1930, with the 1896 Clark refractor. Now renovated, you can use it to discover something of your own in the world’s first International Dark Sky City. What is it? 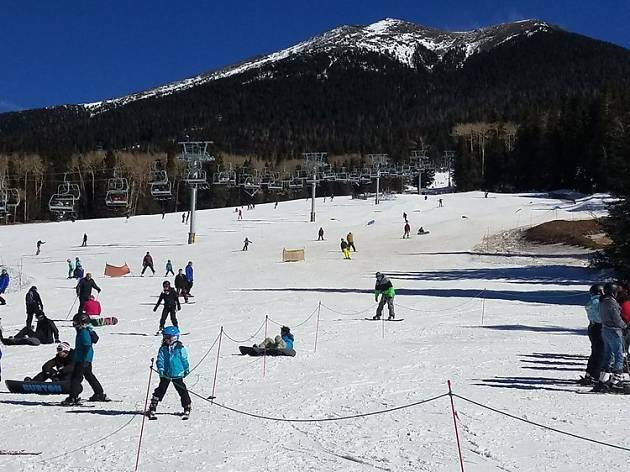 The state’s largest (of three) ski resort on the San Francisco Peaks, home to Humphrey’s Peak, has been a recreational playground for 80 years. Why go? During the summer, visitors take the ski lift to the top (11,500 feet) for picnics, hikes, summer tubing, wildlife watching and other outdoor fun. In the winter, they ride up for downhill skiing and snowboarding on three terrain parks, and now ski biking. What is it? At 12,633 feet, this is the tallest point in Arizona, with a 360-degree view at the top, including glimpses of the Grand Canyon. Why go? Approximately five miles of rocky climb, this challenging hike is arduous, and the 3,000-foot increase in elevation difficult to handle. It is recommended for experienced hikers, best from late spring to early fall. Dress for cold weather at the top and be prepared to turn back if a storm breaks. What is it? This is a city-wide network of non-motorized, shared-use pathways. Why go? Experience 56 miles of the 130-mile plan. Most of it is paved, but parts along the edge of town consist of the dark red gravel (crushed volcanic rock) common to the area. Some paths are single track, such as the path along the Arizona Trail below Walnut Canyon. It’s a safe recreational space for hikers, joggers and cyclists. Maps are available online. What is it? Nearly 1,000 years ago, the Sinagua people built cave dwellings into the cliffs at what is now known as Walnut Canyon. Why go? Follow the Island Trail to access about two dozen remaining cliff dwelling rooms. The path takes visitors up and back down a few hundred stairs that follow a narrow circular path right beside and through the ruins. A shorter rim trail takes you through a forested area. 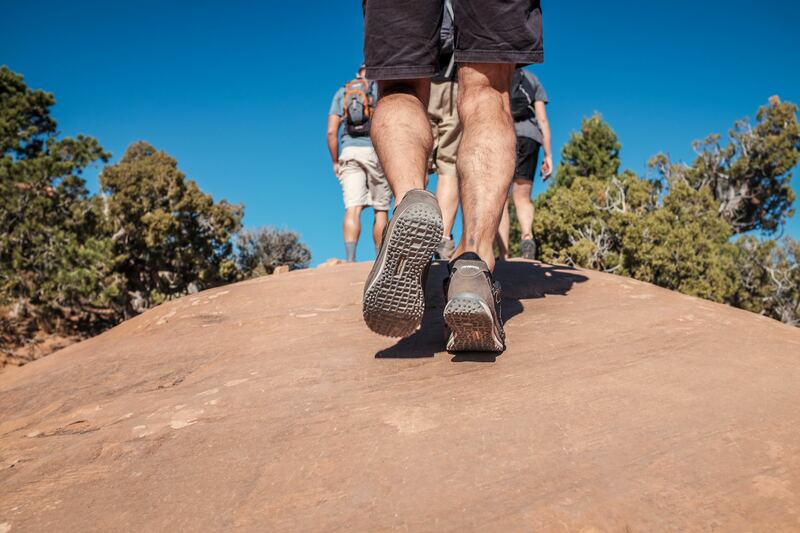 Plan ahead and purchase the permit for ranger-guided tours off-trail. What is it? A volcano erupted in Flagstaff around 1085, leaving this large, ancient crater behind. Why go? For the best view, visit during monsoon season when sunflowers in Bonito Meadow are in bloom, highlighting the cinder cone in the background. Look for the ancient red cinders on the rim, nearly petrified with age. 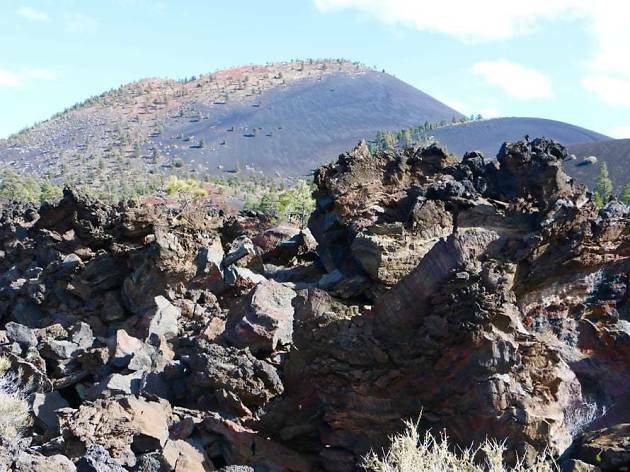 An easy one-mile hike along Lava Flow Trail at the base of the crater takes about 30 minutes. Stop in at the Visitor Center to learn more. What is it? 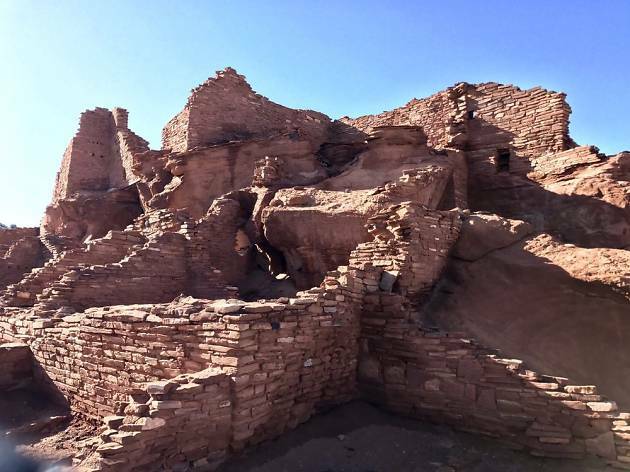 Follow the Wupatki Pueblo Trail to see the ruins of this ancient and spiritual location where Pueblo people lived 800 years ago. It is now a national monument. Why go? Now open is a new Heritage Garden, where Hopi blue corn, beans and squash are growing. These crops were staples for our Hopi ancestors. Aside from dwellings, archaeologists have excavated a ball court on site, where the ancients might have held ceremonies and played games. 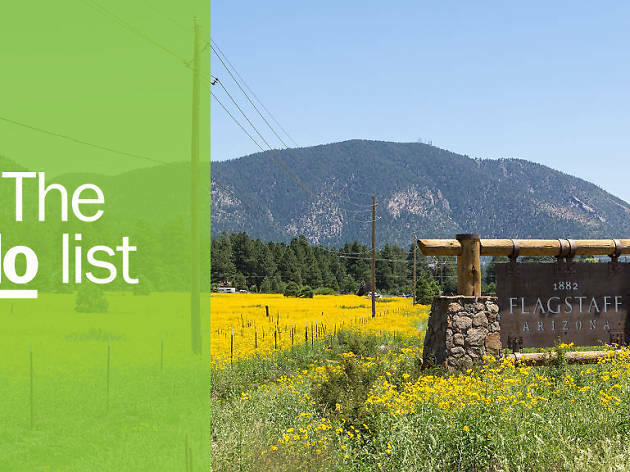 Tip: an annual Flagstaff Monuments pass covers the entrance fee for three national monuments operated by the National Park Service. What is it? 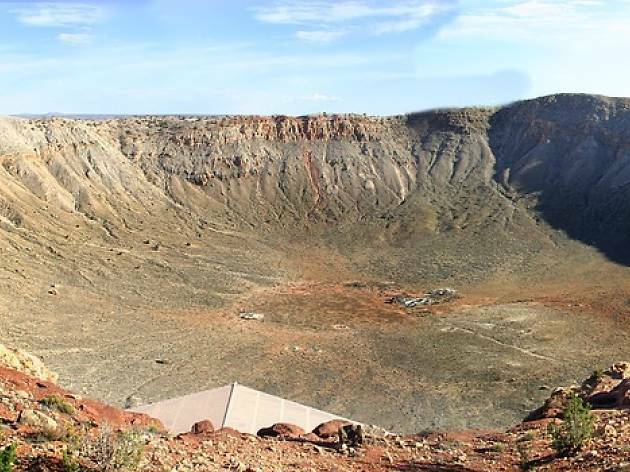 Fifty thousand years ago, a meteor the size of a small sedan, traveling at 26,000 miles per hour, fell to earth, slicing a hole that is one-mile-wide, 2.4 miles in circumference and more than 550 feet deep. Why go? It is one of the world’s most well preserved impact sites and is privately owned. The attraction includes guided rim tours with several view points on the trail, an interactive Discovery Center and gift/rock shop, and a movie that re-enacts the day of impact. What is it? 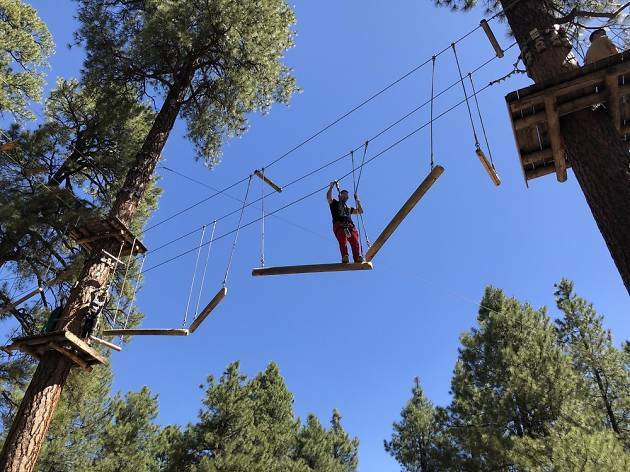 Both kids and adults can test their limits in these obstacle courses suspended from treetops at Fort Tuthill County Park. Why go? Safety lesson first, but then participants are set free to navigate various zip lines and rope courses. Between circuits – color-coded by difficulty – that get progressively more difficult, participants climb rope ladders, scramble over walls, walk across wobbly bridges and more. Plan for about three hours to complete the entire course.